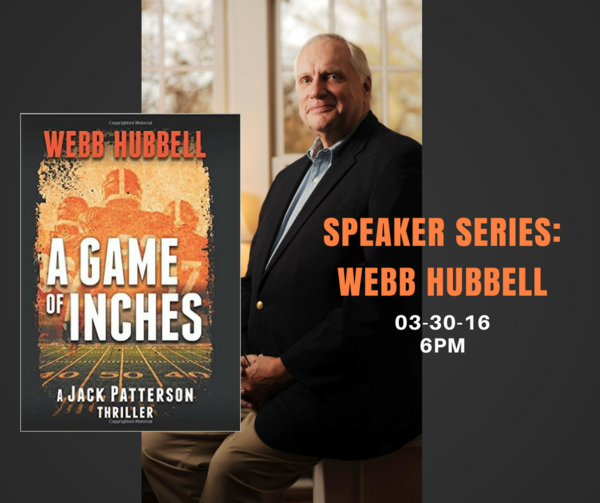 Join us as the Library Society welcomes Webb Hubbell as he discusses his recent release A Game of Inches. Does trouble follow Jack or does he come looking for it? In Webb Hubbell’s third legal thriller, A Game of Inches (Beaufort Books, June 2016), DC attorney Jack Patterson tackles the NFL, fantasy sports, and the power of information in our nation’s capitol. Webb Hubbell is an award-winning author, lecturer, and consultant. As a former Mayor of Little Rock, Chief Justice of the Arkansas Supreme Court, and Associate Attorney General of the United States appointed by former President Bill Clinton, he is well-versed in the intricacies of the U.S. government and our criminal justice system, and he bring his first-hand experience and unique knowledge to every page. As a former Razorback football star and Chicago Bears draftee, he brings his special insight into the current state of the game of football.